To incentivize you to use units not in your primary Armies (we know this one can be tricky, so keep reading). We realize that the current system is not satisfying these goals, so we want to talk today about changes we are making to the Bounties feature in the next update. When we analyzed why bounties were failing to meet our first goal, we identified a few culprits. Bounties that required wins under certain conditions made it very hard to know how long your bounties would take. On a perfect day, you could complete these quickly, but on a bad day, you could battle over and over, struggling to get that last win, all while losing medals. This is not the type of experience we want to deliver with the Bounties system. Faction Bounties are changing from “Win battles as [faction]” to “Play as [faction]”. This means, as long as you play as both factions, you will complete these bounties. Specialist Bounties that require killing with specific units are changing to require you to build a specific unit. This makes it easier to track how many units are needed to complete the Bounty. Specialist Bounties that require winning with a certain Commander are changing to require you to use a specific Commander Ability a certain number of times. This change is intended to get you to effectively use Commander Abilities in battle instead of simply having the Commander in your Army. We are getting rid of the Bounties that require you to win without conceding a missile. We are keeping the Bounty that requires you to kill an enemy Harvester. We realized the Crate rewards coming out of the the Bounty system were not accurately reflecting the amount of work you put in. 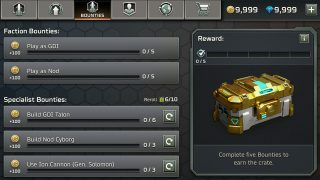 You could do 99% of the work, but only receive approximately 70% of the reward because you would get an Uncommon Crate instead of a Rare Crate. Once our next major update goes live, the progress you make towards your next Rare Crate will not reset. To simplify the feature, we are removing the Common and Uncommon Crates from the system, but now reward you with a Rare Crate whenever you complete five Bounties, even if those five bounties are completed on different days. We all have one or two Units that we just do not like and receiving a Bounty for those Units is infuriating. We do, however, like that Specialist Bounties encourage using other units. People in the studio have tales of getting a Bounty they felt was annoying, but in completing it, found a new unit they enjoy; I personally, discovered my love for the GDI Orca in this way. But we also understand that this is not always the case. With our next update, we are adding the ability to reroll Specialist Bounties with Fuel, so by playing an extra battle or two, you will be able to get rid of a pesky bounty. Rerolling will also ensure you do not get served a Bounty you already rerolled that day. But be careful, if you reroll through all your available Specialist Bounties, you will cycle through the list again. Earning Fuel and ordering Crates is the other primary reward system we have been keeping a close eye on. Similar to Bounties, ordering Crates has not provided you with a consistent expectation of how much you need to play each day in order to maximize rewards. We also realize, that different players have different play habits--some people play a few battles at a time over the course of the day, while some like to sit down, focus, and play a ton of battles in a row. We want the Crate system to be flexible enough to support both of these types of play habits. 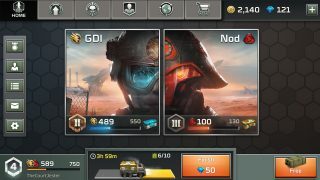 These changes will not only make each battle feel more valuable, they intend to allow you to play C&C: Rivals the way you want, while still maximizing rewards. We are excited to make these changes to Bounties and Crates in the next update and will continue to listen to your feedback about these systems while monitoring their performance. Let us know what you think of the changes to the Bounty and Crate system on Twitter and Discord.